Pre Draft Report: Growing up in British Columbia, Tyson Gillies played on the same club team (Langley Blaze) that produced Scott Mathieson and is coached by Mathieson’s father. Overcoming a childhood impairment that has left him with 30% hearing in one ear and 60% in the other, Gillies was drafted in the 25th round of the 2006 draft by Seattle out of Mountain HS in Langley, British Columbia. He played the 2007 season at Iowa Western Community College under the old ‘draft and follow’ rules before signing with the Mariners, helping lead Iowa Western to the Junior College World Series. At the plate Gillies looks like Vladimir Guerrero to me, except left-handed, until he actually swings the bat. Gillies lacks plate discipline like Guerrero, but also lacks the once-in-a-generation talent that Vlad the Impaler possesses. Tyson’s best attributes right now are his speed and defense, though it is not out of the question that he could develop a little power. At best, Tyson Gillies is an extremely raw long-term project. Gillies signed with Seattle after the JCWS, right up against the midnight deadline a week prior to the ’07 draft. Career Synopsis: Gillies made his professional debut shortly after the 2007 draft, starting in the Arizona Rookie League and getting a handful of at-bats in short season Everett in the Northwest League. Combined he posted a .255/.358/.330 line with 24 Ks and 6 BBs over 109 PAs. Following the season, he participated in the Arizona Instructional League. In 2008, Gillies began the year in extended spring training before being assigned to Low-A. After struggling there over 11 games, he was sent to Everett when the league started. Gillies showed marked improvement across the board, finishing at a combined .302/.421/.410 while striking out 52 times and walking 36 times in 275 PAs. He was named Everett’s Player of the Year and the 15th best prospect in the Northwest League by Baseball America. Its writeup at the time noted his line drive stroke that sprays the ball to all fields and his knack for drawing walks. Going into 2009, Gillies hit the prospect radar, appearing at #20 on BA’s list of Mariners’ prospects. He returned to High Desert in the California League and had a monster season (the hitter friendliness of High Desert notwithstanding). Gillies hit .341/.430/.486 with 44 steals in 63 chances. He significantly cut down on his strikeouts (81 in 593 PAs) while continuing to draw walks (60). He shined as the Mariners’ representative in the Futures Game. Following that season, Gillies came over to the Phillies as part of the package in the Cliff Lee deal. Expectations were great going into 2010. BA ranked Gillies 8th among Mariners prospects prior to the trade, while John Sickels ranked him 8th among Phillies prospects and Baseball Prospectus ranked him 4th. Unfortunately, the season was a complete disaster. After being invited to a big league camp for the first time, Gillies was assigned to Reading to begin the season. He started slowly, compiling a .185 batting average through late-April before a 20-for-51 streak got him close to .250. However, a left hamstring strain sent Gillies to the DL on May 10. While he returned in mid-June, the problem stayed with him the rest of the year. He only logged a total of 117 PAs on the year, hitting .243/.302/.336 with 24Ks and 7 BBs and just two steals. Of course, any recap of Gillies’ 2010 season would be incomplete without a mention of the bizarre incident that led to an arrest on cocaine possession charges in August (even though the charges were subsequently dropped). 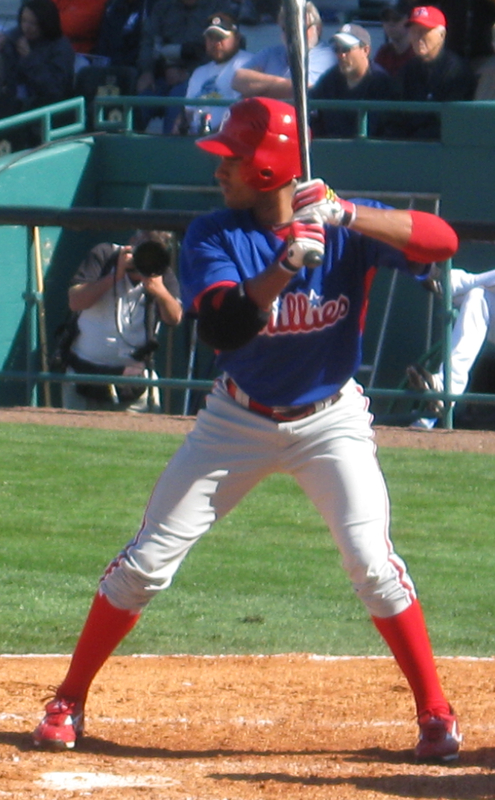 The lost season of 2010 dimmed Gillies in the eyes of the experts as Sickels dropped him from the rankings altogether and BA lists him at #16 among Phillies’ prospects. Summary: Gillies has excellent speed, which is an asset both on the bases and in centerfield. He should hit for a solid average, and though his in game power is a tick below average now, he has good strength and could hit 10-15 HR per season in the majors, solid numbers for a centerfielder. Defensively, his arm is average and his range is very good, which should give him a chance to be one of the best defensive outfielders in the majors in his prime. Upside: Gillies brings a lot to the table, especially if he’s able to maintain the walk rate that he developed in the two years prior to the trade. Accounts are that his hamstring is completely healed, so his plus-plus speed should be back. He’s also an exceptional defender with a lot of range and a strong arm. On the downside, Gillies also needs to show that the K rate at Reading last year was an aberration. He also has not developed much power, although some scouting reports note that there’s still the potential for some development there. The arrest last year appears to be in the rearview mirror, as he’s always had a reputation for outstanding character. (From personal interactions with him, I can say that even in the context of how decent pretty much all the players are at the Carpenter Complex in talking with the fans, Gillies is exceptionally friendly). The most important things for Gillies in 2011 is getting 600 plate appearances against good AA and AAA pitching, staying healthy, and keeping his K/BB ratio in a decent range. If he does all of those, he’ll be back on track to potentially replace Shane Victorino as the Phillies CF in 2013.